The southbound Glenn Highway has reopened after it was shut down Friday evening to allow rush-hour traffic to proceed north from Anchorage past earthquake-damaged sections of road, authorities say. An updated alert from Anchorage police said the highway had reopened to traffic in both directions as of 9 p.m. Friday. The closure took effect at 5 p.m.
Traffic is being rerouting through medians and emergency passes and onto the Old Glenn Highway. The temporary closure allowed commuters to get out of Anchorage and ease rush-hour congestion, said Anchorage police spokesman MJ Thim. • Glenn Highway: Tractor-trailers and semi-tractor trailers with doubles headed toward Anchorage will be stopped before Mirror Lake. • Eagle River Bridge at Glenn Highway: Closed, follow detours. • Minnesota Boulevard at International Airport Road: Southbound off-ramp is closed. • Mirror Lake exit off Glenn Highway: Southbound off-ramp is closed. • Dimond Boulevard at Minnesota Drive: Closed. • Knik River Bridge: Periodic closures, follow detours. • Dowling Road at C Street: Detours due to at large crack in the roadway. • Eagle River Loop Road at Mills Bay Drive: Detours due to sinkhole. 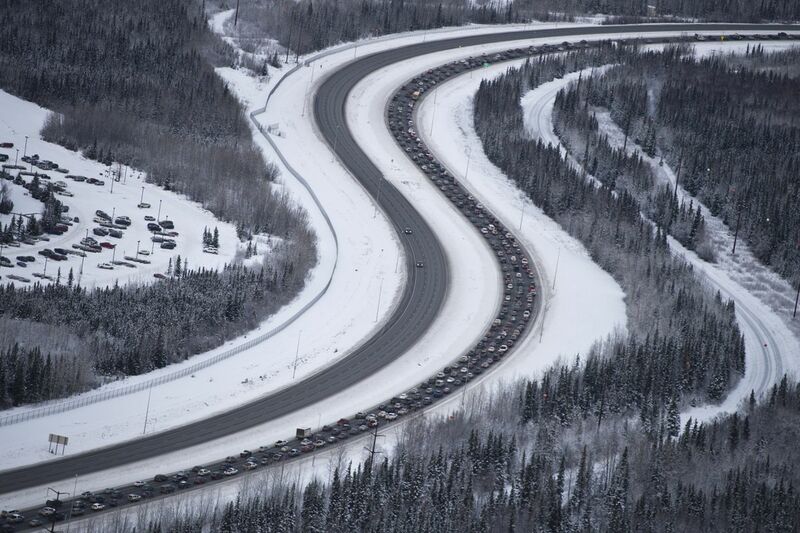 • Glenn Highway at the Palmer interchange exit: Northbound closed. • 36th Avenue at the Seward Highway: One lane, follow detours.